Home | Eat, Drink & Be Merry! | Mayor's Own Marinara Sauce, 16oz. Home | RI Gift Baskets and Gift Certificates | Design Your Own Custom Gift Bag or Basket | Mayor's Own Marinara Sauce, 16oz. Mayor's Own Marinara Sauce, 16oz. The Mayor's Own, benefitting Providence school children. 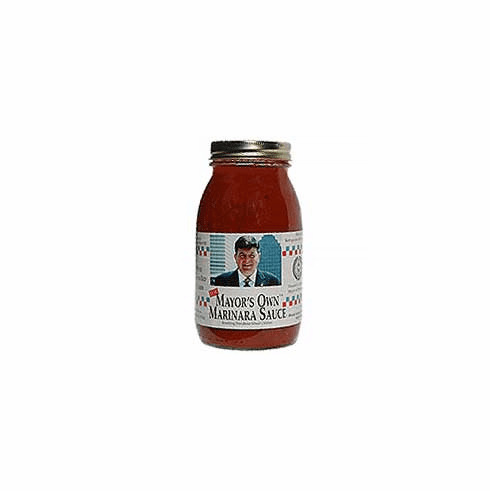 Proceeds from Buddy Cianci's own marinara sauce are used to grant scholarships to deserving kids. The sauce itself is pretty tasty, too! PLEASE NOTE: We cannot ship orders exceeding 4 jars of Mayor's Marinara due to the excessive weight of the glass jars. We are unable to guarantee they will arrive safely. Thank you for your understanding.